The question we are most frequently asked is Which forklift would be right for my business? To help answer this question there is a brief outline below of the most common types of forklift used in the UK. Being small and manoeuvrable 3 wheel electric forklifts are best suited to indoor applications where space is limited. Due to their 3 wheel configuration they have a small turning circle and are ideal for working in manufacturing areas and small warehouses. They are able to be used outdoors due to them being fitted with solid superelastic tyres, but they will need to be used on smooth ground with limited gradients. 3 wheel electric machines are available in lifting capacities from 800kg – 2000kg with either 24, 36 or 48 volt battery power. 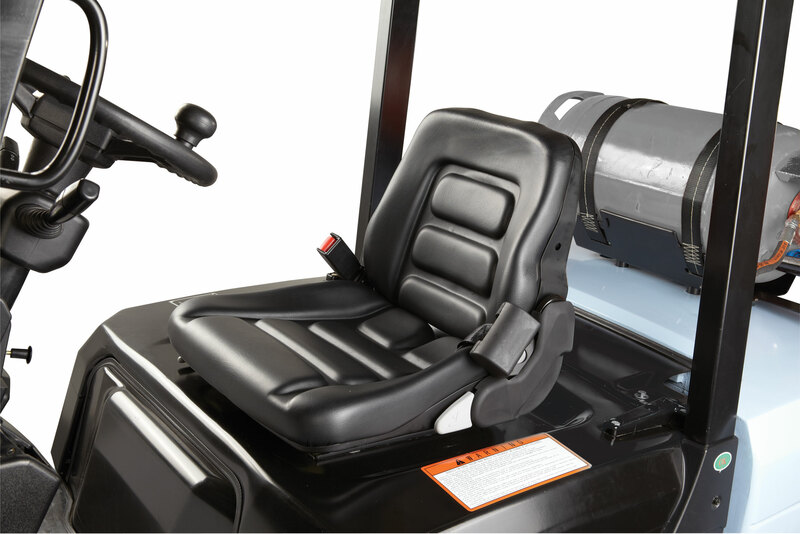 LPG powered forklifts can be used in applications where indoor and outdoor use is needed. They can be operated continuously with the only need to stop being to replace the gas fuel bottle. This makes them ideal for extended use over long periods and in that respect better than electric powered forklifts as they do not need to be taken out of use for long periods for battery charging. With larger chassis’ than electric powered machines they are less suited to work in small warehouses due to their larger turning circle. They are however better suited to coping with more uneven ground conditions. Diesel powered forklifts are most suited to outdoor work and are more economical to operate than gas powered forklifts. They do produce more noise than gas forklifts making them less suitable for indoor use, and are also limited for indoor use by their larger chassis size in the same way as gas powered machines are. Diesel machines are normally more powerful than the equivalent sized gas forklift so are more easily able to cope with gradients and rougher outdoor surfaces. There are two common types of pallet stackers available – those with “wrap over” forks and those with “straddle” support legs which fit around the outside of a pallet. The wrap over fork type machines are more compact than their straddle counter parts making them able to work in more restricted space. The downside of the wrap over type machines is that they are fitted with support legs which the machines forks wrap over, with these being left on the floor when the forks are raised, meaning they are only suited to use with euro pallets or stillage’s. The straddle type machines support legs are outside the perimeter of the load so can be used with any type of pallet or stillage but require more space to manoeuvre. Pallet stackers are commonly available with lift heights from 1.5-4.0 mtrs and lifting capacities of 1000-1600kg, and are for indoor use. Pallet trucks are either manually operated and normally known as pump trucks or electrically powered and normally known as powered pallet trucks. Pallet trucks are used for transporting of pallet loads over varying distances depending on how the machines are operated. Obviously manually operated machines have to be physically pulled or pushed by the operator so are only suited to moving small loads over relatively short distances. Rider pallet trucks – where the machine is electrically powered for travel and lift and the operator is either seated or stood wholly inside the machine and used over long distances. Pallet trucks vary in capacity from 1000-2500kg and come with a wide variety of different fork lengths and widths to accommodate different sized loads. Articulated forklifts have been in the market for over 30 years, but have come to the forefront of the materials handling industry in the last 10 years. They are able to work in aisle widths of a little as 1600mm and lift to heights of 12 mtrs, giving a very high density of storage. They also have the ability to be able to operate outdoors making them a truly multi-purpose machine. More and more people are now aware of the benefits of articulated machines in offering increased storage capacity and the ability to be used to load and unload lorries to decrease the size of their forklift fleet and while gaining increased storage capacity in existing buildings. Man up machines – where the operator cab rises with the forks enabling the operator to both pick and place full or part pallets and to pick orders as well. VNA machines are normally guided in the working aisles either by and inductive wire guidance system or fixed guide rails. For this reason VNA trucks are able to operate at high speeds and offer very high pallet retrieval and storage rates per hour. VNA trucks are very complex and are built to order for the specific application they are purchased for and are not normally easily changed between applications. The age of a forklift is an important factor to be taken in to account when deciding on a machine for your business. If your intended usage is going to be high, i.e. more than 1-2 hours per day then an older forklift (10 years +) would not be ideal. It is also important to look at how well the truck has been maintained over its life as a young but poorly maintained truck will be less reliable than an older machine which has been well looked after. How important are the hours usage of a used forklift? The hours’ usage on a used forklift are similar to the mileage on a used car. The higher the hours or miles then the less life there is left in it. Again, if you need a forklift to work 1-2 hours per day then you will need to pick a machine which has average hours usage (5-10,000 hours) and if you wish to work more than this, 3-4 hours, then you will need to look at a machine with lower hours usage (under 5000 hours) to give reliablilty and a long service life. 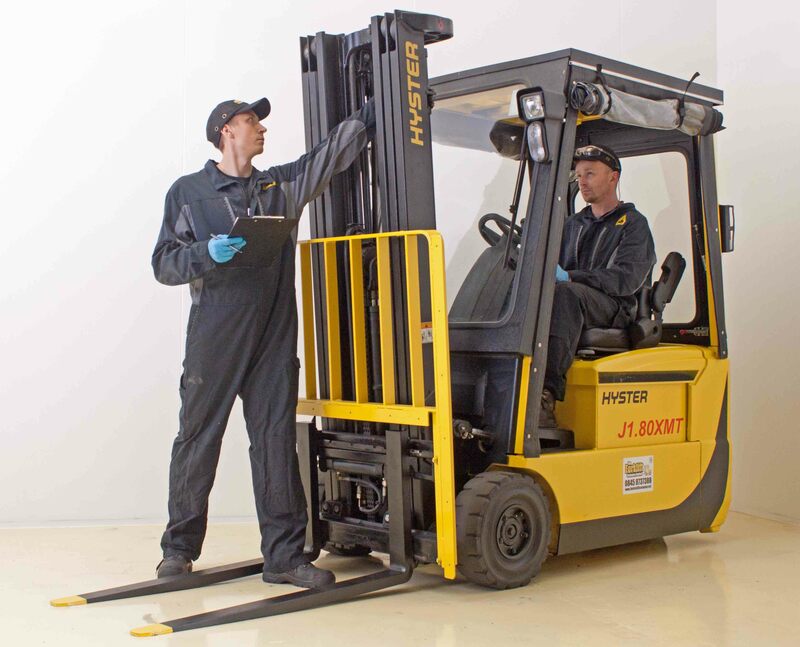 As with all pieces of mechanical equipment, the length of its life will depend on how well it is looked after and regular maintenance and servicing will extend the life of your forklift. If you wish to use your forklift for more than 4 hours per day, then you will need to look at new machines. What is the life expectancy of a used forklift? The lifespan of a used forklift depends on how many hours per day it is used for, the type of application it is working in, how well it is maintained and who it was manufactured by. A forklift which is well maintained in a clean application such as a small warehouse or light manufacturing unit could last over 20 years if it is correctly maintained and serviced, depending on its daily hours usage. Customers in harsh applications such as foundry’s, recycling, fisheries or where harsh chemicals such as salts or other corrosives are present must expect to have to change their forklifts more often. We at The Forklift Company Ltd only purchase equipment from either the original manufacturers or main dealers so we can be confident that the machines have been correctly maintained and in many cases have service and maintenance records available. How often will my forklift need to be serviced? Every forklift manufacturer has varying guidelines for the servicing of their machines which vary between every 250-500 hours use. Generally, most people purchasing a used forklift truck will be using their machine for 1-2 hours per day. On this level of usage we would recommend that forklifts are serviced twice per year. At 6 months we would recommend an inspection service where the major safety and wear items are checked and lubrication and adjustments are carried out. On a 12 monthly basis we would recommend a filter service where on engine powered trucks the air, oil, fuel and transmission filters are changed and spark plugs on LPG powered machines with the engine oil also changed. Every two years we would recommend that hydraulic oil filters are also changed. A Thorough Examination is a requirement under law (LOLER/PUWER regulations 1998) that all mechanical handling equipment be examined not less than every 12 months by a competent person. 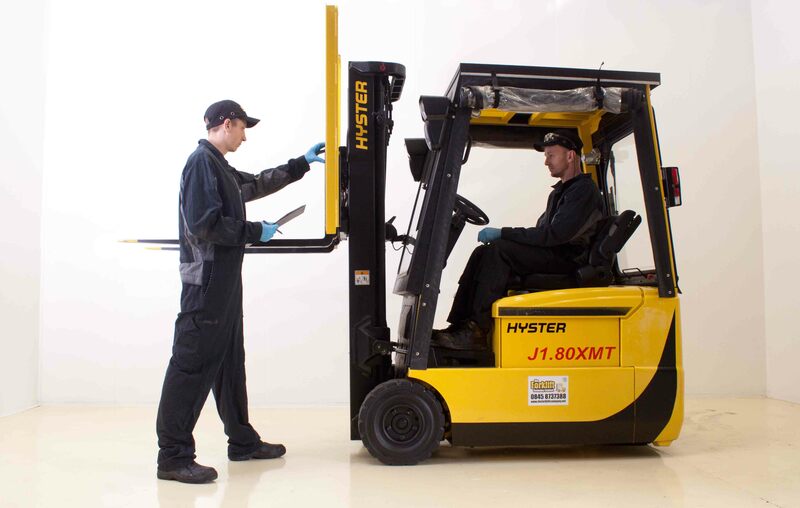 The examination covers all the safety critical items on a forklift, not just the load handling components. Some machines will need to be examined more often than 12 monthly depending on their usage, such as if they are being used to lift persons they need to be examined every six months. 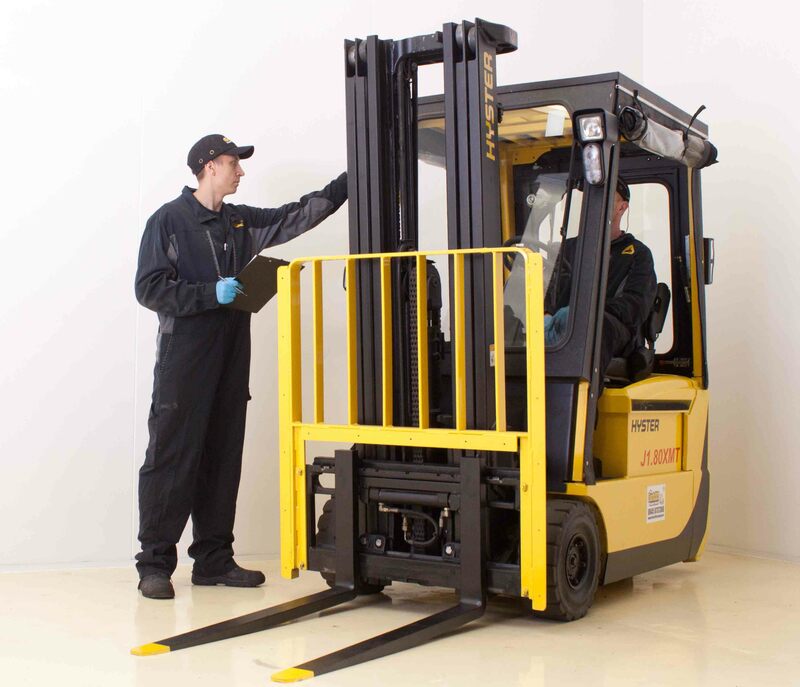 All used forklifts supplied by The Forklift Company Ltd are independently examined by Statutory Inspections Ltd as part of our workshop process, so you can be assured that every truck we supply is safe and fit for use. Following this we have our own engineers who are trained and certified by CFTS Ltd who govern the UK Thorough Examination scheme, who can carry out your next Thorough Examination on your site to make sure you comply fully with the latest legislation. A sideshift is an attachment commonly fitted to forklifts. The fitment of a sideshift allows the operator to horizontally move a load left or right in order help them position it correctly for stacking or de-stacking. It is a particularly useful thing to have when working in confined spaces making stacking and de-stacking of pallets quicker and easier. A sideshift is not standard on a forklift truck so if you require on then please make sure you thoroughly check the specification of any truck you are looking to purchase – or simply enquire with one of our knowledgeable sales team. What attachments are available for my forklift? Booms – for carrying carpets or coils of wire etc. It is important to note that fitting an attachment to any forklift will reduce its lifting capacity, quite dramatically in some cases and it is important to consider this when choosing a forklift. What affects the load capacity of a forklift? All forklift trucks have two capacities – the nominal capacity, which is how much the truck will lift with no attachment fitted to a certain height at a given load centre, and the residual capacity, which is how much the truck will lift if fitted with an attachment to its maximum lift height at a given load centre. 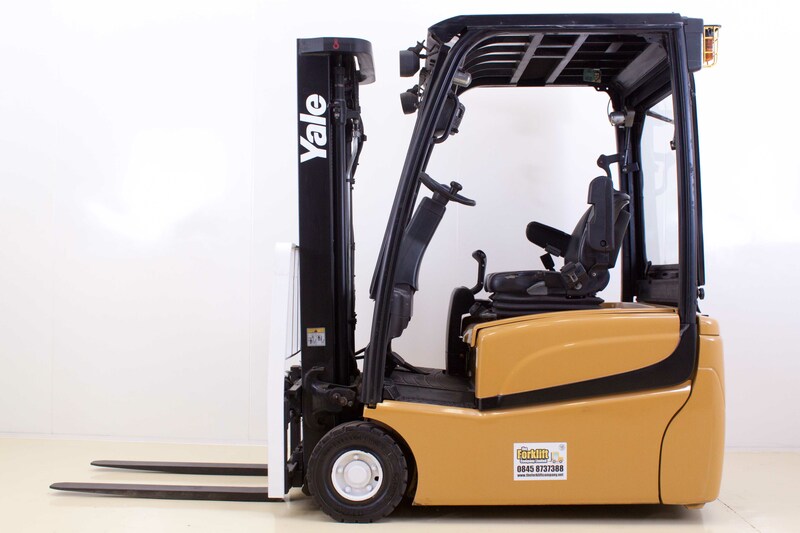 In reality, a forklift with a 2500kg nominal capacity may only have a residual capacity of 1700kg if it has a lift height of 4800mm and is fitted with a sideshift. It is important to check with our sales team that the forklift you wish to purchase will have sufficient capacity to lift your loads to your required lift height, especially if it has an attachment fitted to it, or if it is not a standard pallet size load. What is the load centre? Which forklift will cost the least to run? Overall, electric forklifts will have the lowest cost of ownership. They have fewer moving parts and therefore require lower maintenance requirements. 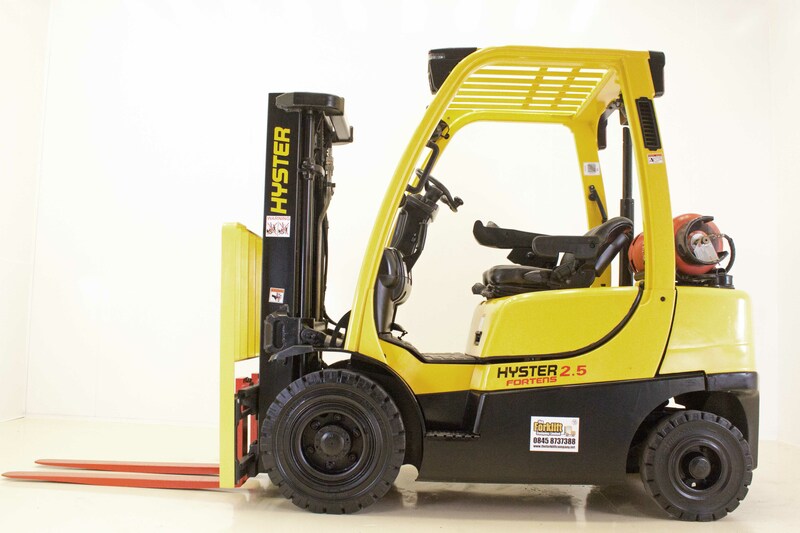 The cost of charging electric forklift batteries is also less than fuelling a gas or diesel powered forklift.Diesel powered forklifts will be the next least expensive truck to own due to the lower fuel cost of diesel compared to LPG and the fact that diesel engines are more fuel efficient than LPG powered engines. How long will an electric forklift battery last on one charge? All the forklifts we supply are load tested for a period of 2 hours continuous use (1 hour on pedestrian operated machines), so this is the minimum time you can expect your battery to last for in use. In reality, the battery may last for longer than this, and the battery life will depend on how well it is maintained and how often it is charged. If any customers require a single charge shift guaranteed over two hours we are able to offer upgrades on batteries for either service exchange batteries with a full 12 month parts and labour warranty and guarantee for 4 hours use on a single charge or brand new batteries with 5 year warranty. What is the best type of charger – single or 3 phase powered? The answer to this question depends on the machine you are purchasing your buildings electrical supply. As a general rule, 24, 36 and 48 volt chargers will be able to be powered from a single pahse supply. Larger 48 volt chargers may be better used from a 3 phase supply, as they can consume upwards of 40 amps. 72 and 80 volt chargers are usually more suited to 3 phase supply as they draw large currents from the mains. It is not recommended that any forklift battery charger is wired to run from a standard domestic 3 pin socket, and should either be hard wired in to a mains supply or connected through an industrial round plug and socket. Every charger supplied by us will be fully tested on your machine for a full charger cycle prior to despatch. For insurance and legal purposes we cannot supply any battery chargers with any cable or plugs to connect to customers mains supply. For safety reasons, all forklift truck battery chargers should be connected by a qualified electrician. What is the difference between different types of forklift masts and which one do I need? Duplex – A 2 stage mast which offers excellent visibility to the forks due to the wide gap between the upright mast sections. The limitation of a duplex mast is that as soon as the forks are lifted the overall height of the mast will increase. This means forklifts fitted with duplex masts are unsuitable for working in buildings with restricted headroom or under mezzanine floors. 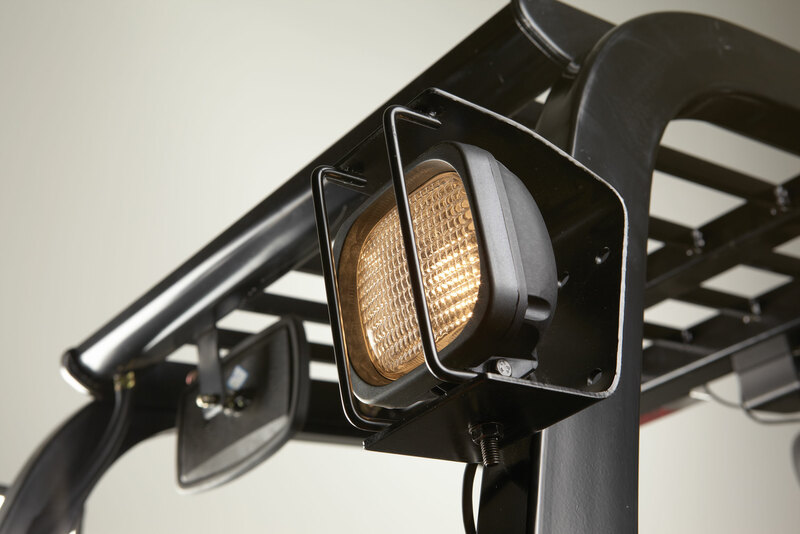 The are well suited to outdoors applications or where internal building height is good. Can I use my forklift on the road? The use of a forklift on public highways is permitted, with restrictions. The task to be undertaken must require less than 1000 yards of driving, otherwise the forklift has to comply with construction and use regulations and have type approval which may require major modifications to the machine. If the task the truck must perform will require less than 1000 yards road travel then the regulations are much simpler. Any truck used on the road must be registered and insured and must also comply with lighting and operator regulations. If you need any further information please contact a member of our sales team who will guide you through the process to ensure we supply the correct specification machine that suits your requirements. In addition to offering after sales advice, we provide all customers with a 30 day money back guarantee for complete peace of mind. Purchases can be made using either BACS or Debit Card.